to announce that it has been recognized as an Apple Distinguished School for 2016–2018 for its innovative teacher-leaders, its successful 1:1 iPad Program implementation, and the thoughtful integration of technology throughout its PK-12 program. The Apple Distinguished School designation is reserved for programs that meet criteria for innovation, leadership, and educational excellence, and demonstrate a clear vision of exemplary learning environments. Walk into any classroom at Shorecrest to see technology supporting student success. For example, in the Center for Medical Sciences applied sciences track, Upper School students use iPad and the 123D Sculpt+ app to create 3D models of organs to be printed in the school’s makerspace. The 1:1 iPad Program allows students access to class content anytime, anywhere. 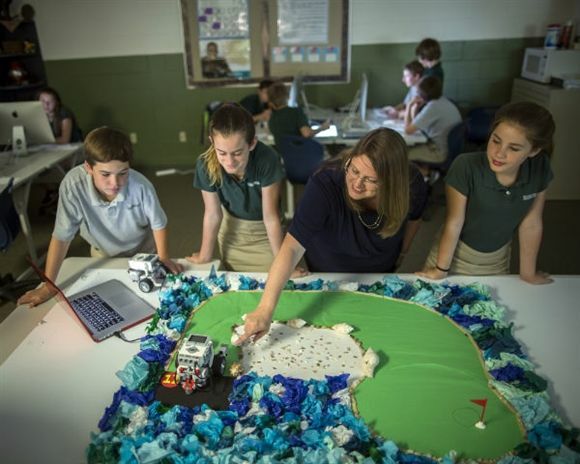 In fact, 70 percent of the course materials in the Middle and Upper Schools are in digital format, providing different learning options for students and minimizing the school's environmental footprint. Even the youngest of Shorecrest’s students use technology to support their research and in-depth project work. For example, Junior Kindergarten (4- and 5-year-olds) students utilize the augmented reality app Popar® World Map and a class iPad to explore and research animals up close. This allows for experience via technology when literal hands-on experience is unavailable or unrealistic. As technology and pedagogy continue to evolve, Shorecrest maintains faculty professional development as a top priority, ensuring teachers have the resources, skills, and habits of mind to best serve their students. Click here to view our multi-touch book about the Shorecrest journey of innovation from its 1923 humble roots to its 2016-2018 Apple Distinguished School recognition.